On August 26, 2010, we finished day two of our workshop! It all went well – some hiccups, but nothing impossible to overcome. We got a little lost on the way to Cruma, but we were able to get there only five minutes late, and still earlier than most of the catadores we were working with. By the time people had arrived, we were set-up. We spent the first half of the day going over the system and discussing people’s concerns. For example, “Will it damage my engine?,” was a common question. I was impressed with some of their prior knowledge of how diesel engines work and their ability to predict what could potentially go wrong. After lunch, we started to work on the tank. Unfortunately, there was a delay in most of the parts we ordered, and items that should have been there were not. We sent a couple of our teammates to go pick-up the materials, and realized that there had been some miscommunication, and several of our parts were not usable, including some important fasteners. I missed the morning session because I was working on the manual with our advisor, Libby. 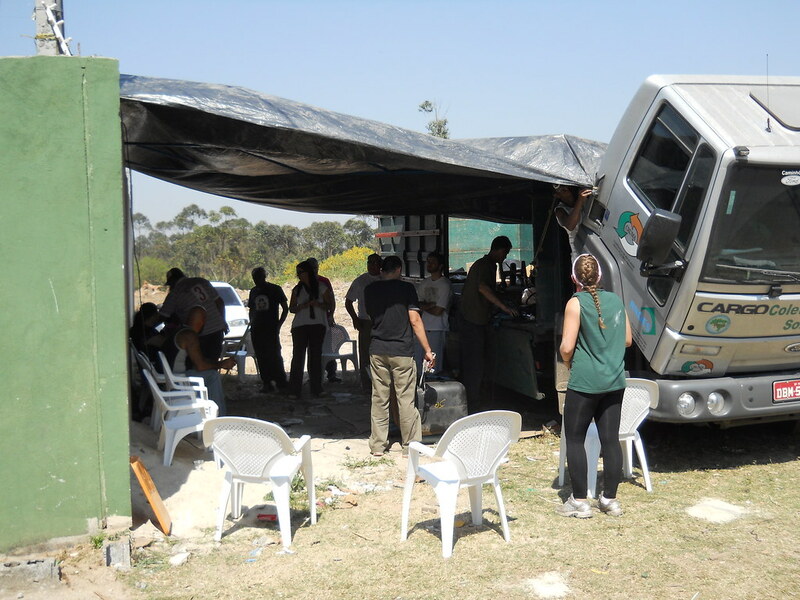 When I got to the site the team was working on the truck. Apparently, when they got to Cruma in the morning, the catadores were filtering more waste vegetable oil (WVO). It was a hotter day than before, so people really seemed to be dragging, and when lunch came around, I think most everyone was ready for a break from the outdoors. After lunch, we started working on the coolant and fuel systems, running the hoses and connecting things where they needed to be connected. People really seemed to be interested in this part. Unfortunately again, we were left with incorrect materials, and didn’t have the correct valves for the last part of the fuel system conversion (making the return line split into WVO or diesel). We had some issues with the tank because it had some junk in it and got clogged, but luckily, this was easy to fix. It was really encouraging to see more people, and a lot of returners, at the second day workshop. It meant people were still interested, and actually cared about what was happening. One man in particular, Edson, is mechanically-minded and already filters WVO. He has really shown a lot of interest and has been an amazing help in explaining the system in Portuguese. There was some downtime on the second day, and some of the other people asked him a few questions about the hoses that we had just put in the vehicle. While I’m not fluent in Portuguese, he seemed to understand and explain everything correctly. The ingenuity of the people we are working with really impressed me. They were willing to give opinions about the system and have some great comments. A few times we didn’t have all the parts necessary for the conversion, and needed to ask them to help us find something. Every time this happened, several people would come back within five minutes with the perfect item. The goal of the third workshop is to have the catadores do a lot more of the actual conversion. It will show who the leaders are in their group, and just how much they actually retained from the past two days!